Wychavon District Council has secured a successful prosecution following the dumping of business waste. Mr Gary Waring, 40 (DOB 20.06.69), the owner of Waring properties in Redditch, was fined £750 for an offence under the Environmental Protection Act 1990. He was also ordered to pay a £15 victim surcharge and costs of £790 by magistrates in Worcester on Thursday 11 February 2010. Mr Waring, of 66 Marlpool Road, Redditch, had sold a van that had not been cleaned out – the van still had a quantity of commercial waste from a property that had been refurbished. This waste was later found fly-tipped in a farmer’s gateway near Broadway. Officers from Wychavon District Council found evidence in the fly-tip that led them to Waring Properties. The Magistrates were satisfied that Mr Waring had failed in his Duty of Care to dispose of waste properly by leaving commercial waste on a vehicle that was sold, despite the fact that he held a licence for carrying waste. Residents can report fly-tipping on the hotline 01386 565656. Orion and Pam Moon have confirmed they will be standing as independent candidates in the Lodge Park ward. Although only one seat will be available both will be hoping they win it. The Church Hill ward will also be contested by husband and wife Richard and Isabel Armstrong although two seats are up for grabs here. Due to the press interest in this article this link has the contact details for the canidates standing in Redditch borough council elections. Bill Hartnett who lives in Bromsgrove dosen’t deserve to be a councillor how can people have faith in him when he shows such serious error of judgement himself. The Green Party is has a candidate in every ward in Redditch. New College Redditch will be hosting a youth employment event on Monday, March 5th. MWA will be mandatory for all customers who are referred. There is no voluntary access to MWA. Coaches will be running to provide free transport for those traveling, to ensure that all Jobseekers can attend. A number of education providers and partners will exhibit stands at the event, along with local employers including Connexions, JHP, BARN, Poundland, Bromsgrove District Housing Trust and the Army. It is being held at Redditch New College Campus, where there will also be information on apprenticeships. The DWP will be rounding up unemployed 18 to 21 year olds on Monday and putting them on coaches for a jobs fair in Reddich. Tesco, Poundland,and McDonald’s must be short of free labour as that’s where they will all be Tuesday Morning all working for free on so-called Voluntary Work Activity, Mandatory Work Activity, or Workfare It all means the same thing working for free or lose your benefit. Have you ever wondered why a jobs fair is taking place? At certain times of the year Job Centre Plus will have what they call a trailblazer, this is where they pay extra money to providers of meaningless training Courses to get the numbers up taking part. A training provider gets a bonus payment for every extra unemployed person they get on an unpaid work placement or training, but only during the trailblazer period. A trailblazer will run from 23rd January 2012 to 31 March 2012 in 5 districts across 3 CPAs. Funding is available for a maximum of 3000 additional referrals in total. A unique PRaP opportunity number is open to trailblazer referring offices only, until 16 March, to enable all trailblazer starts by 31 March 2012. The sanction regime for MWA is a 13 week sanction for the first offence followed by a further 26 week sanction for a second offence within 12 months. Once sanctioned, a customer will not be referred back to complete Balance of Time. 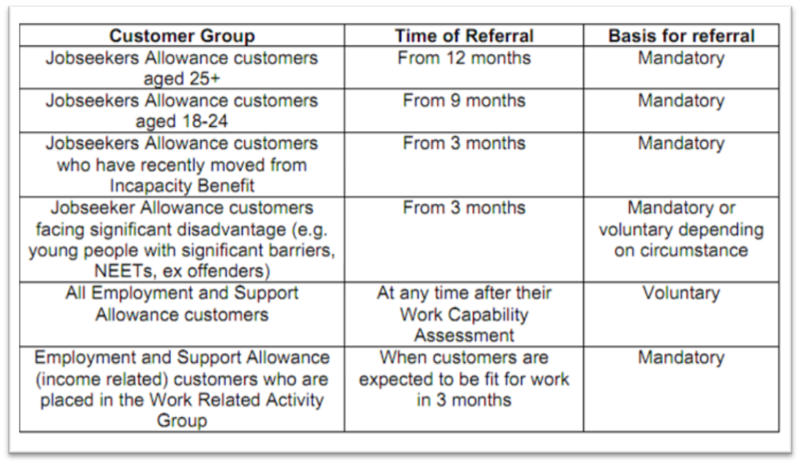 However, if the JCP Adviser decides it is appropriate a new referral to MWA could be made at any point following the sanction decision. This is what happens when MP’s don’t read the documents on laws they voted for. This week we have been made aware of an allegation of attempted fraud in relation to a Mandatory Work Activity contract with A4e. We have begun a formal, immediate investigation of this allegation. As a result of this new allegation DWP has immediately commenced its own independent audit of all our commercial relationships with A4e. We have required A4e to make available all documentation which our auditors may require and provide full access to interview any A4e employees. This is separate from the independent review of internal controls which A4E has previously announced. The Chief Executive of A4e was informed of this at a meeting with a senior DWP official earlier today. We have made it absolutely clear to A4e that we take this matter very seriously, and that if at any point during the audit or thereafter we find evidence of systemic fraud in DWP’s contracts with A4e we will not hesitate to immediately terminate our commercial relationship. Sometimes laws look good on paper but not in practice as highlighted below. 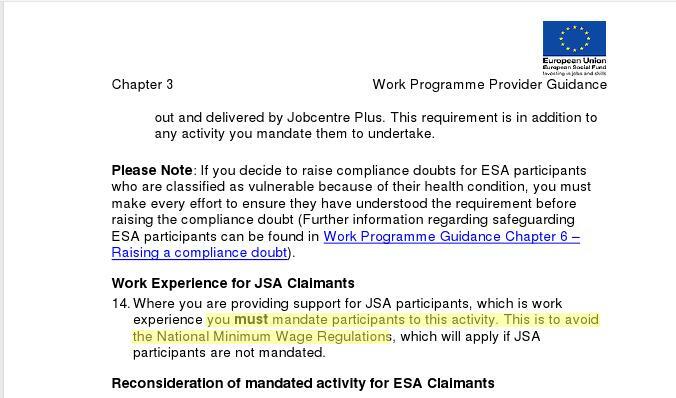 The guidance given to providers of Mandatory Work Activity can be found here http://www.dwp.gov.uk/docs/pg-part-p.pdf and here. 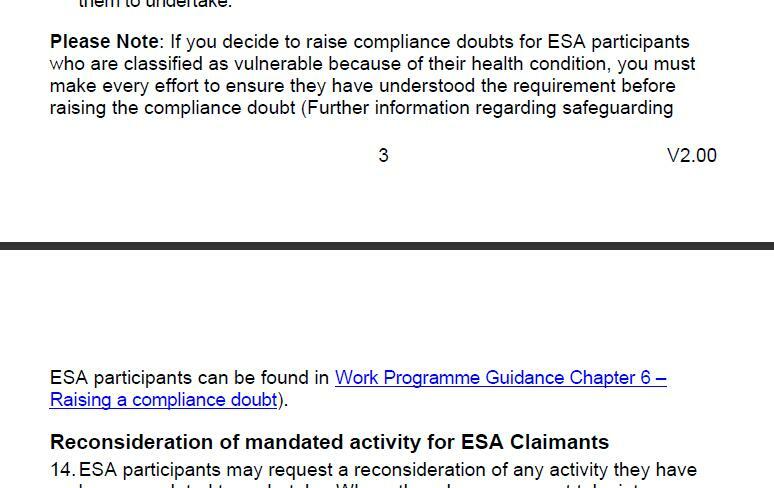 Some of the information the DWP give out on people claiming benefits may well find themselves in breach of the Data Protection Act. The http://www.ico.gov.uk/ data privacy for individuals. Building on existing youth employment and work experience programmes, and with the addition of wage subsidies, we believe the new Youth Contract has the best possible chance of making a real difference for young people. Leading up to the launch in April, Government Ministers and officials will be talking about the Youth Contract to a wide range of stakeholders including small and medium sized employers, voluntary sector organisations and Work Programme providers. Raising awareness of the key features – apprenticeships, work experience, and wage incentives – will help get the Youth Contract off to the best possible start. We welcome your support in this, and would really appreciate it if you would publicly pledge your support through www.dwp.gov.uk/youth-contract/ DWP will keep in touch with employers who sign up pledge their support to provide updates on the Youth Contract in the coming weeks, and explain how to notify us of current Work Experience or Apprenticeship placements they are looking to fill. The UK’s jobless figures continue to rise and many unemployed people may feel that they have no chance of finding a job, but there are opportunities out there for those who might consider retraining. As part of the Government’s overall ‘Get Britain Working’ measures Droitwich Spa training company Train2Succeed has been chosen to participate in the strategy. As a recognised centre for training excellence in the health and social care sector, it continues to gain momentum and a string of professional accreditations and accolades to prove it. In conjunction with the Association of Care Trainers and local Job Centre Plus, Train2Succeed is rolling-out a series of unemployment courses and job fairs throughout South and North Worcestershire. Venues include Droitwich, Kidderminster and Redditch and Worcester. The events have been devised to attract job seekers to consider employment opportunities in the health and social care sector. People that have been unemployed for more than 12 weeks that are over 19 years of age are eligible to participate in the scheme. If they wish to commit to the programme they will be given an intensive 7 day training course. At the end of the session, if successful, they will attain a City & Guilds Accredited Qualification Preparing to work in the Health and Social Care Sector Level 1 and would have had the opportunity to meet potential employers and in some cases to try work experience . Train2Succeed’s director and founder Sue Rickwood is naturally proud that her centre has been chosen to support and drive the initiative and undertake the training. The health and social care sector desperately needs an influx of dedicated and highly trained people committed to providing quality care for the elderly. Mrs Rickwood said: “We think our role is much more about delivering the training for those who wish to work in the health and social care sector although that is really important. The UK’s aging population is continually growing as we are living longer. Sustaining levels of quality care is so important. Imagine our anxiety when loved ones experience poor levels of care from people that are untrained, unprofessional and often unfeeling. Train2Succeed provide a wide range of health and social care courses for employees and employers in the nursing home, nursing agency and learning disability sectors. It prides itself on its success delivering introductory to advanced level qualifications. Mrs Rickwood continued: “Interestingly the first event we held in early February at our Droitwich training centre we had a higher proportion of male candidates enlisting in the programme. This sets a precedent as traditionally caring is a career choice more favoured by females. We are excited that we have we been chosen to lead this initiative but more importantly we feel we are helping to nurture and influence a more positive attitude towards the provision of providing quality care for our community which starts in the classroom.” Only unemployed people can take part soTrain2Succeed can get payments for them. Provider Referral and Payment system (PRaP).